The last-ever hanging in El Paso, Texas, on this date in 1900* was distinguished by an astonishing attempted fight to the finish by the two doomed men. Parra, by far the more notable character in this drama, was long an infamous desperado in the borderlands. Though known for all manner of outlawry, he was specifically hunted by the Texas Rangers for slaying one of their number, John Fusselman, in a mountain ambush way back in 1890. Parra was in jail in New Mexico for an unrelated robbery under an assumed name when he was recognized as the wanted murderer. Texas Ranger John R. Hughes cut a deal with the Sheriff of Dona Ana County, New Mexico — a lawman you might have heard of by the name of Pat Garrett. ** Garrett wanted a fugitive hiding out in Texas, and arranged to extradite Parra in return if Hughes could find the man for him. Flores’s, shall we say, passion would prove an asset for the desperate duo on their final day. The gallows had only a single trap, so the two men were to hang consecutively. When guards came to retrieve Antonio Flores, however, both he and Parra raced out of the open cell door wielding homemade blades — steel wire twisted and sharpened into makeshift daggers. Dallas Morning News, January 6, 1900. With the certainty of immediate death upon them, the prisoners made a desperate melee in the little hall. 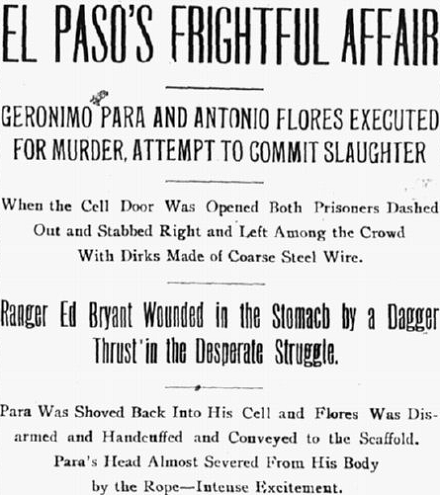 Flores planted his cruel dirk into the stomach of a deputy named Ed Bryant, while Parra scored glancing blows on two men before he was shoved back into the cell. While the rustler looked on helplessly from behind bars, the available toughs piled onto Parra and subdued him. Parra was trussed hand and foot and dragged straight to the scaffold for instant execution. On pain of prospective death by the constables’ revolvers, Parra too submitted when his turn came, and satisfied himself with declaring his innocence on the gallows — after which the noose nearly ripped the man’s head clean away. 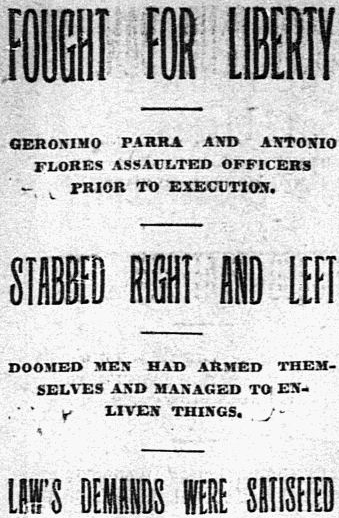 San Antonio Express, January 6, 1900. Spare a thought for these long-lost frontiersmen when next visiting the gorge where Ranger Fusselman caught that fatal bullet from Parra’s gang of cattle rustlers: Fusselman Canyon. * Some sites give January 6 for the execution date. The primary sources here unambiguously show this is incorrect. ** Famous for shooting Billy the Kid. Pat Garrett served only a single term as sheriff of Lincoln County; his reputation for excessive violence and shady associations helped to give his career in New Mexico and Texas a somewhat vagabond quality. Dear Rudy: You are family! Was Nestor Flores your father or grandfather? Travis from the above reply is my nephew and yes, Jose was the brother of Nestor. I have all of the newspaper accounts. We have been searching for family for a long time. My grandfather, Jose, passed away in 1977 but left a large family in Kansas. My email is lnorris02@hotmail.com and I am on Ancestry. Thank you, Lynda Hermreck Norris . Would like a newspaper account of the trial of Antonio Flores. my Grandfather. Please. Antonio was my great, great grandfather. His son Jose was my great grandfather. Please email me if you can at “herm_14@yahoo.com”.